Here at Artstraws, we recently got involved with the Welsh Air Ambulance Service, a fantastic and extremely worthwhile charity to support. At a recent charity auction, our MD, Roger Russell won, with the highest bid, a Real Madrid shirt signed by Welsh footballer, Gareth Bale. Initially, this was to be used to act as an incentive for our Swansea based staff and Welsh sales people. However, the initial auction shot up alarmingly and so, we, as a team, decided to frame the signed shirt and donate it to a local charity to raise further funds. A great idea! The Welsh Air Ambulance Service need to raise £6.5 million every year just to keep three helicopters running and on standby for emergencies across Wales. We couldn’t have chosen a more worthwhile charity to support. Roger Russell and Mark Sharp, Artstraws’ salesman for Wales and the Midlands, travelled to the ambulance base in Llanelli and personally handed over the signed t-shirt to Chris Hingston, one of the very lovely and experienced doctors that accompany every emergency flight. completing 26,000 missions so far. An amazing feat! 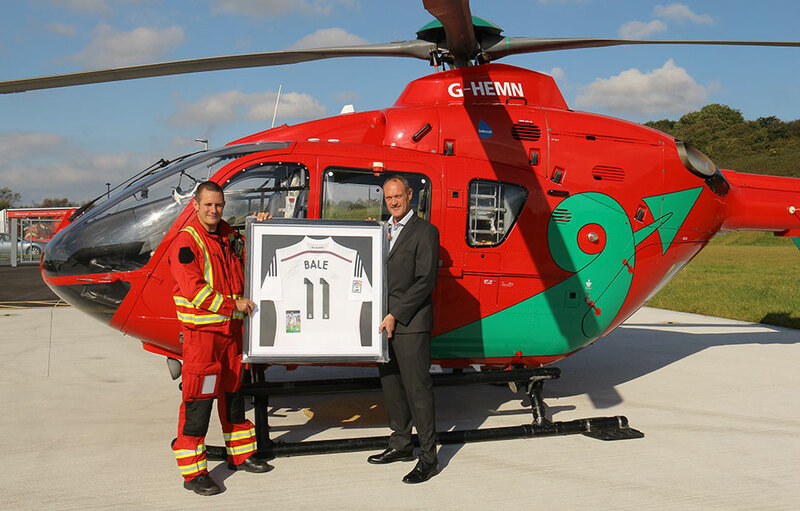 To celebrate this The Gareth Bale shirt was featured as the main prize in a special raffle. The winner of the raffle very generously donated the shirt straight back to be auctioned and a total amount of £1,100 was raised! As well as the range of high-tech medical equipment carried within the helicopters, there are specialist medical devices such as a specially designed incubator for new born babies. The team for each mission includes a doctor and a paramedic, and it may surprise you to know that they even carry a standard first aid kit with them – much like one you might even keep in your car. This is because, by law, all helicopters flying over the UK must always carry a first aid kit. Stay up to date with Artstraws’ latest fundraising activities by reading our regular blogs.